A juvenile dark-eyed junco under the red columbine plant. One afternoon back in early June, a junco exploded from underfoot when I was in the garden. I didn’t think much of this, even though the same thing happened (in about the same location) a couple of days later. Dark-eyed juncos are common up here. Their habits keep them close to the ground where I’m likely to see them. 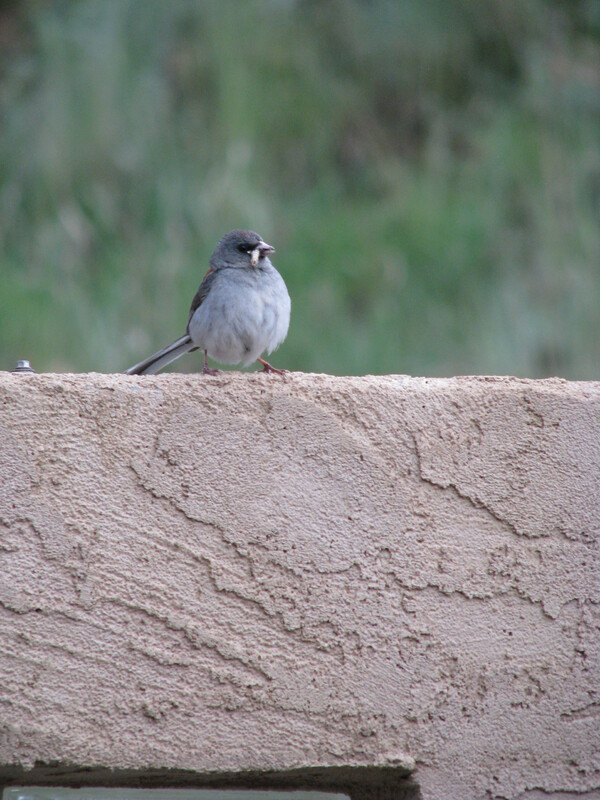 After many years, I recognize them automatically, whether by their plumage (gray with a rust-colored back and bright white bars along either side of their tail), or by their peeping chatter. I think the birds might regard me more favorably than most of our wildlife neighbors do, since a number of my activities create feeding opportunities. The slightly pudgy birds like to forage in the garden, and a small flock is usually in attendance when I feed the horses in the winter, ready to clean up dropped grain and pick through the hay for seeds. I admire the juncos for over-wintering up here, and one of the small perks of plowing is seeing them converge on the ribbon of dirt behind the pickup, scratching for seeds. The junco in the garden didn’t elicit a second thought, then, until I was looking for strawberries in the patch in the northwest corner of the garden and uncovered an elegant cup of grass. Duh. The junco was building a nest when I disturbed her work. I was afraid I might have forced the little gray bird to relocate her efforts, but two days later I peeked in, and the cup contained a pretty egg, delicately peppered with rusty flecks. The next day there was another. And the next day, still another. Finally, there were four. Look close, to the left of the strawberry leaves: the bright eye. I tried hard not to be a pest, but this opportunity to glimpse the domestic life of one of my neighbors was just too much. I reasoned that the birds knew what they were getting into when they chose their site: that they’d accepted my bumbling but intermittent presence as a reasonable trade-off for the garden walls’ protection from wandering deer, elk, cows, coyotes, and other potential marauders. I started sneaking over to that corner of the garden to check in after feeding horses and recording weather information. 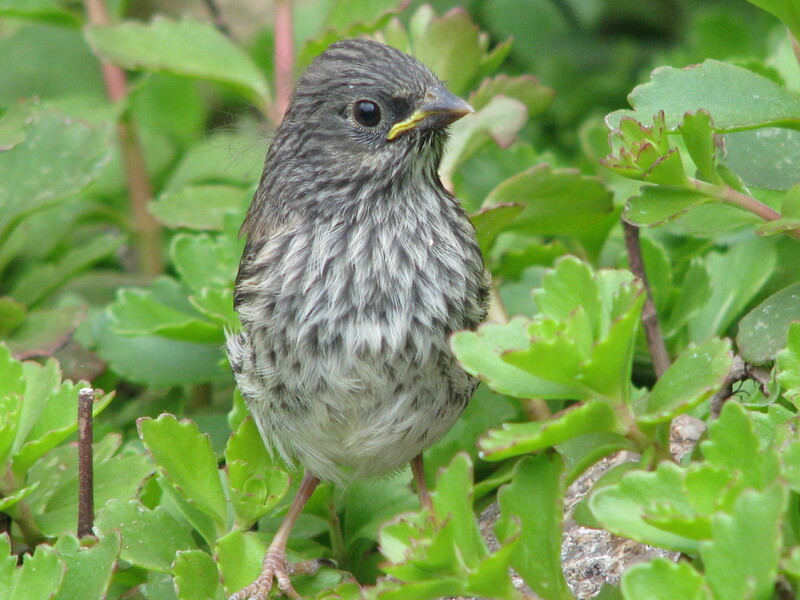 If a junco was on the nest—stock-still, its glossy eye, unblinking, on me—I would creep away. 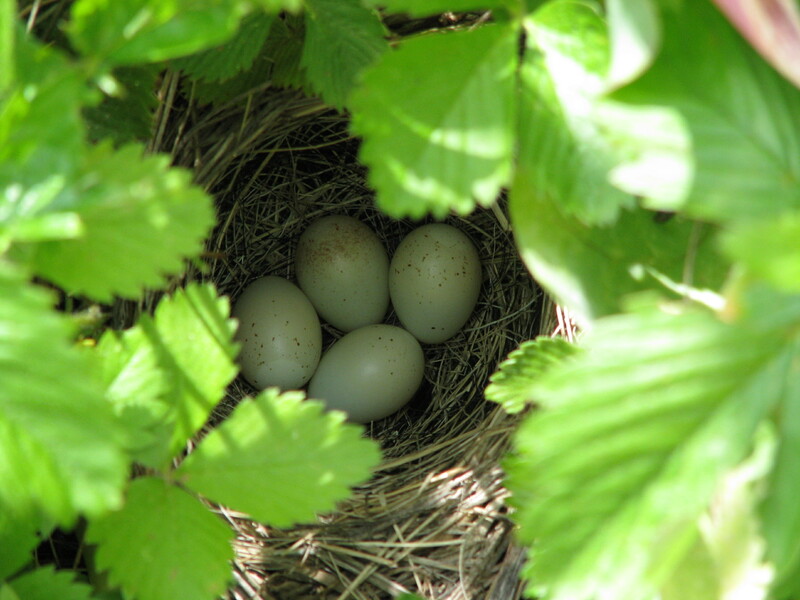 But if there wasn’t an adult on the nest, I’d part the covering canopy of strawberry leaves and admire the little eggs. After about two weeks, I peered in to find the pale smooth ovals replaced by blobs that looked for all the world like wads of pink bubble gum that had been dropped in dark gray lint. Count the beaks: still four. Within days, the airy fuzz began to yield to itty-bitty feathers laid out in neat lines showing that certain of the now-bony lumps were destined to become wings. Yellow beaks in the shape of a curly bracket—}—marked other lumps as heads. 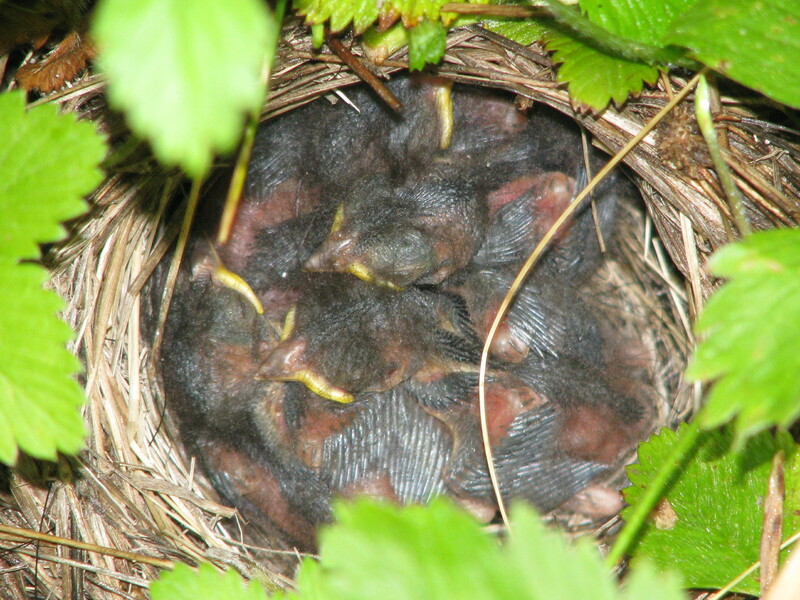 It wasn’t long before the nest was starting to overflow with rapidly growing baby birds. 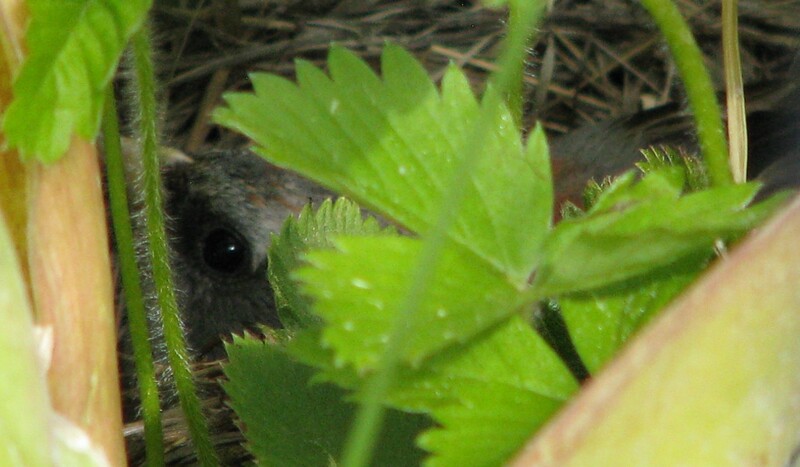 After a little over a week, I decided the birds must be indifferent to my snooping, and started to look for strawberries under the plants next to the wall, a few feet from the nest. A strawberry plant emitted a plaintive and accusing “Pweeep! !” and a little gray bundle scrambled out from under my reaching hand. I decided I’d best sacrifice the berries in that corner until the kids had flown the coop, lest I step on someone. Like the three sets of bluebird parents raising broods in the nest boxes around our place at the same time, the junco parents were kept busy. They’d arrive on the wall with a white grub, check the perimeter, and swoop down, clicking to the babies, who clicked back at them, shoving at one another to get to the front of the chow line. 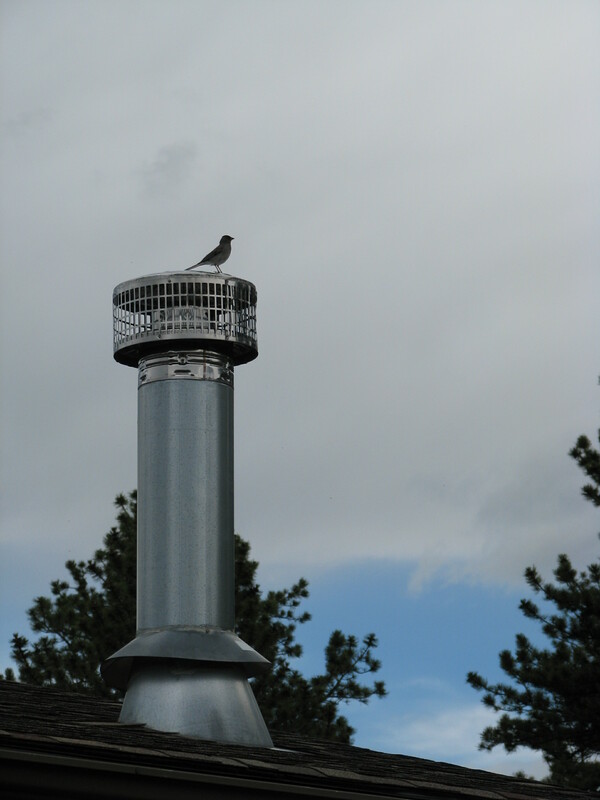 The other parent, which I couldn’t help but think was the male, favored the chimney cap as a lookout, keeping watch as babies hopped around and begged. The nest, outgrown, was abandoned for the playpen of the strawberry patch, the rhubarb, and the dense thicket of the red columbine in the southwest corner. About two weeks after the eggs had hatched, I was lurking in the garden hoping to snap some baby pictures. The clicking chatter between the adult up on the wall and the babies hidden in the garden’s greenery was like a Geiger counter in a radioactive hotspot. One little bird hopped out of the cover of the columbine plant and, after snack from mom’s beak, abruptly purred upward and over the wall, the sound of its stubby wings calling to mind a toy airplane powered by a twisted rubber band. A parent on lookout: surely that’s a dad thing? By the next afternoon, there was only one youngster still inside the wall, and the adult junco on feeding duty (Mom, in my mind) seemed exasperated. She brushed in front of me as I entered the garden, her rapid clicking sounding to me like a scold. I figured I should leave the family to their affairs, and left as soon as I could—though maybe she was hoping I’d make a run at the kid and chase it over the wall. The next day, there were no baby birds hopping around between the vegetable plants, no adult birds bustling and calling from above. Quiet has settled back over the planting beds. I don’t have to watch where I’m putting my feet. I’m free to pick strawberries wherever and whenever I want. The garden is serene, but maybe just a little bit lonely. 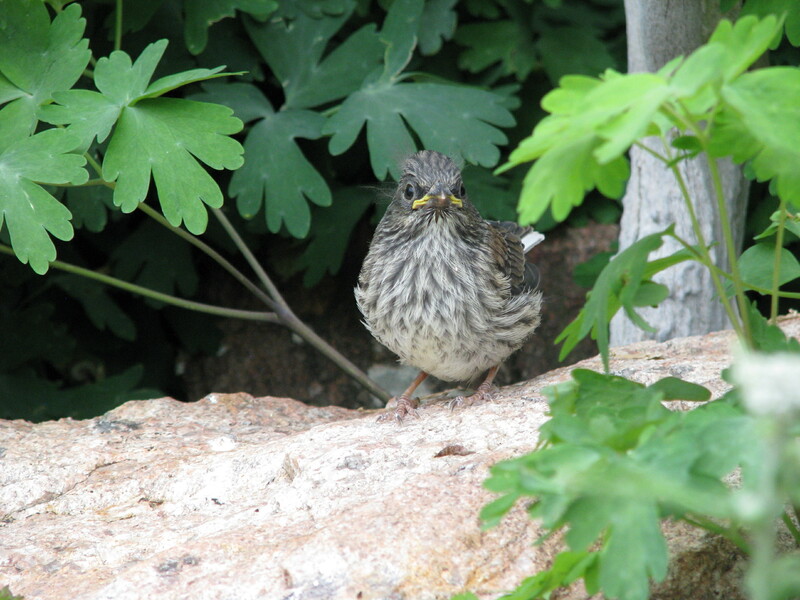 This entry was posted in birds, wildlife encounters and tagged bird eggs, Dark-eyed juncoes, fledgling birds. Bookmark the permalink.